Nothing brings out the well-tailored lobbyists in Washington quite like a threat to corporate welfare. With the Export-Import Bank’s legal authorization set to run out this year, the Chamber of Commerce recently led a Big Business march on Capitol Hill to protect what is known as Boeing’s Bank. 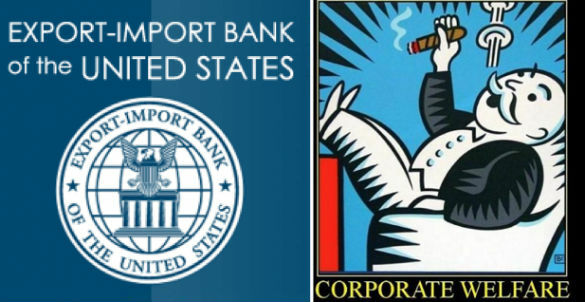 Over the last eight decades ExIm has provided over a half trillion dollars in credit, mostly to corporate titans. Congress should close the Bank. The agency was created in 1934 to underwrite trade with the Soviet Union. The agency uses its ability to borrow at government rates to provide loans, loan guarantees, working capital guarantees, and loan insurance. ExIm is not free, as claimed. Recently made self-financing, the agency has returned $1.6 billion to the Treasury since 2008. However, economists Jason Delisle and Christopher Papagianis warned that the Bank’s “profits are almost surely an accounting illusion” because “the government’s official accounting rules effectively force budget analysts to understate the cost of loan programs like those managed by the Ex-Im Bank.” In particular, the price of market risk is not included. Delisle and Papagianis figured ExIm’s real price to exceed $200 million annually. Economist John H. Boyd took another approach, explaining: “For an economic profit—that is, a real benefit to taxpayers—Eximbank’s income must exceed its recorded expenses plus its owners’ opportunity cost, a payment to taxpayers for investing their funds in this agency rather than somewhere else.” He figured the Bank’s real cost at between $521 million and $653 million in 1980. Given the recent explosion in Bank lending the corresponding expense today could be much higher. The Bank claims to create jobs. No doubt, Exim financing makes some deals work. But others die because ExIm diverts credit from firms without agency backing. ExIm also sells itself as necessary to promote trade. Bank president Fred Hochberg told a recent gaggle of supporters: “we want to be the wind in your sales,” pushing U.S. exports. But exports should not an end in themselves irrespective of cost. The Bank supports only about two percent worth of exports, barely a blip in a $17 trillion economy. Moreover, ExIm often subsidizes competitors of American companies. For instance, two-thirds of the Bank’s loan guarantees last year backed Boeing sales to rivals of U.S. airlines. However, international financial markets are sophisticated. And the Bank is busiest in Asia, Europe, and North America, not Africa and Latin America, where the risks are greater. Moreover, it’s impossible to know just how many of the deals currently financed by American taxpayers wouldn’t go through absent the subsidy. Everyone involved in the transaction—borrower, banker, exporter, bureaucrat—has an incentive to claim ExIm played a vital role. The agency claims to support all businesses, including small ones. However, candidate Barack Obama got it right in 2008 when he described the Bank as “little more than a fund for corporate welfare.” The most heavily subsidized industries in 2012 were aircraft and avionics, followed by oil and gas, power generation, and agribusiness. The most money always goes to Big Business. Boeing alone typically accounts for more than 40 percent of the Bank’s credit activities. Corporate behemoths General Electric, Lockheed Martin, Dow Chemical, Bechtel, John Deere, and Caterpillar regularly join Boeing at the federal trough. Veronique De Rugy of the Mercatus Center figured that the top ten recipients collect 75 percent of ExIm’s benefits. Financial institutions and foreign governments also enjoy bountiful subsidies. However, less than half of ExIm credit typically is even directed in this way, let alone proven necessary. Moreover, the fact that other governments are willing to hurt their peoples by channeling credit away from worthier firms in the marketplace in favor of politically well-connected exporters is no reason for America to do the same. A better way to help promote trade would be to strengthen the economy generally. Lower and rationalize business taxes. Cut and streamline regulation. Reduce tariffs, especially on widely used imports, such as steel. Discourage frivolous litigation. Stop subsidizing the defense of prosperous, populous trade competitors. Anyone on Capitol Hill who believes in free markets and limited government should oppose the agency’s reauthorization. Let exporters pay to generate their own profits. Doug Bandow is a Senior Fellow at the Cato Institute. A former Special Assistant to President Ronald Reagan, he is the author and editor of several books, including "Foreign Follies: America’s New Global Empire" (Xulon).